Deer in a Des Moines back yard. A decade-long effort to thin Iowa’s deer herd has been a success and state officials along with conservationists are now talking about changing hunting regulations to ensure current deer numbers are maintained. Iowa Conservation Alliance president Randy Taylor is also a member of the Iowa Bow Hunters Association. “At some point in time we need to get out of the deer reduction mode and into the deer maintenance mode,” Taylor says. Taylor points to a study which indicates deer hunting has an estimated $297-million economic impact on the state’s economy. With a declining number of deer, however, deer hunting is on the decline in Iowa. About 19,000 fewer deer hunting licenses were issued in 2013 — down 11-percent from the peak deer hunting year of 2008. Dale Garner, the head of the wildlife bureau in the Iowa Department of Natural Resources, says the few “hot spots” with an over-population of deer in the state are often associated with absentee land owners who aren’t granting hunters access to that property. “And the next door neighbor, then, has complaints because they’ve got an elevated deer herd,” Garner says. 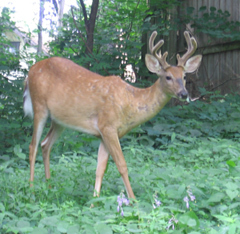 In 2013, there was an average of one new complaint per county about deer eating farm crops. The DNR plans to hold listening sessions around the state in the next few months to give the public a chance to comment on the size of Iowa’s deer herd.